Below you will find my recent podcast recordings, please leave me feed back on the podcasts and let me know if there are questions and topics you would like covered and I will do my best to arrange this. 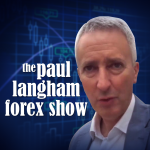 The Paul Langham Forex Show - Podcast Episode 4 - 'FOREX and the idea that ii 'Can't be done'. As we all know in various spheres this is challenge to prove people wrong as it is in Forex.